Ancient wine culture and ultra-modern wineries. Venerable customs and elegant wine events. The finest whites in the world and the down-to-earth sociability of heurige wine taverns. The six Wine Roads along the Danube in Lower Austria take you through unique wine country full of diversity and new experiences. Wine growing along the Danube Valley has a two thousand year (cultural) history. It is assumed wine was already being made from wild grapes by the Celts and Illyrians but systematic wine growing did not begin until the Romans occupied the area. Genuinely useful records on the subject date from the second great wave of colonization starting in the 9th c. Following the subjugation of the Avars, the Bavarian bishops and monasteries in particular began farming the river valleys. 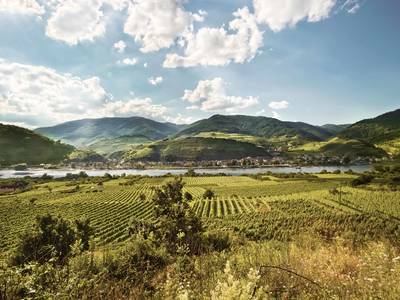 It was at this time that the first terraced vineyards were probably built in the Wachau. The continuity of this development is documented down to the present day by names of wineries or actual ownership. Medieval times were a golden age for wine growing. Large parts of Vienna were planted with grape vines and the French Cistercians exported their already detailed knowledge about wine to the Danube region – a turn of events whose effects can still be seen and tasted today. 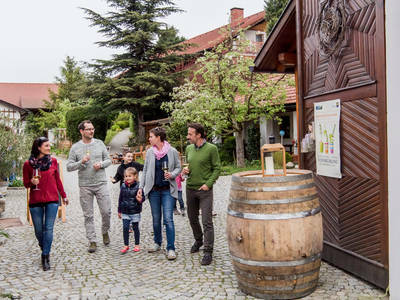 Along the Danube, visitors can still see and experience the history of wine growing. Not in dusty old museums, but on visits to age-old wine cellars such as the one at Klosterneuburg Abbey or at Nikolaihof in Mautern. The latter is one of the oldest in the land. And the wein.sinn Wine World of Winzer Krems manages to be a bridge between old cellars with archived wines that date back to 1948 (still available for purchase) and the modern wine world presented in audiovisual exhibitions. Admission to the largest monument to wine in Austria is free. The natural stone terraces in the Wachau, a millennium task, are still being worked on. The Krems Valley wine region (Kremstal in German) extends on either side of the Danube around the venerable old wine town of Krems. Wine has been grown here for centuries and is still all-present in Krems. Order or download free of charge!